Santiago de Chile ([sanˈtjaɣo ðe ˈtʃile]), or simply Santiago, is the capital and largest city of Chile as well as one of the largest cities in the Americas. It is the center of Chile's largest and the most densely populated conurbation. The city is entirely located in the country's central valley, at an elevation of 520 m (1,706 ft) above mean sea level. According to certain archaeological investigations, it is believed that the first human groups of the X millennium settled in the Santiago basin. The groups were mainly nomadic hunter-gatherers, who traveled from the coast to the interior in search of guanacos during the time of the Andean snowmelt. About the year 800, the first sedentary inhabitants began to settle due to the formation of agricultural communities along the Mapocho River, mainly maize, potatoes and beans, and the domestication of camelids in the area. The villages established in the areas belonging to picunches groups (name given by Chileans) or promaucaes (name given by Incas), were subject to the Inca Empire throughout the late fifteenth century and into the early sixteenth century. The Incas settled in the valley of mitimaes, the main installation settled in the center of the present city, with strengths as Huaca de Chena and the sanctuary of El Plomo hill. The area would have served as a basis for the failed Inca expeditions southward road junction as the Inca Trail. Having been sent by Francisco Pizarro from Peru and having made the long journey from Cuzco, Extremadura conquistador Pedro de Valdivia reached the valley of the Mapocho on 13 December 1540. The hosts of Valdivia camped by the river in the slopes of the Tupahue hill and slowly began to interact with the picunches natives who inhabited the area. Valdivia later summoned the chiefs of the area to a parliament, where he explained his intention to found a city on behalf of the king Carlos I of Spain, which would be the capital of his governorship of Nueva Extremadura. The natives accepted and even recommended the foundation of the town on a small island between two branches of the river next to a small hill called Huelén. On 12 February 1541, Valdivia officially founded the city of Santiago del Nuevo Extremo (Santiago of New Extremadura) in honor of St. James, patron saint of Spain, near the Huelén, renamed by the conqueror as "St. Lucia". (The name Santiago is the local Galician evolution of Vulgar Latin Sanctu Iacobu, "Saint James".) Following colonial rule, Valdivia entrusted the layout of the new town to master builder Pedro de Gamboa, who would design the city grid layout. In the center of the city, Gamboa designed a Plaza Mayor, around which various plots for the Cathedral and the governor's house were selected. In total, eight blocks from north to south, and ten from east to west, were built. Each solar (quarter block) was given to the settlers, who built houses of mud and straw. Valdivia left months later to the south with his troops, beginning the War of Arauco. Santiago was left unprotected. The indigenous hosts of Michimalonco used this to their advantage, and attacked the fledgling city. On 11 September 1541, the city was destroyed by the natives, but the 55 Spanish Garrison managed to defend the fort. The resistance was led by Inés de Suárez, a mistress to Valdivia. When she realized they were being overrun, she ordered the execution of all native prisoners, and proceeded to put their heads on pikes and also threw a few heads to the natives. In face of this barbaric act, the natives dispersed in terror. The city would be slowly rebuilt, giving prominence to the newly founded Concepción, where the Royal Audiencia of Chile was then founded in 1565. However, the constant danger faced by Concepción, due partly to its proximity to the War of Arauco and also to a succession of devastating earthquakes, would not allow the definitive establishment of the Royal Court in Santiago until 1607. This establishment reaffirmed the city's role as capital. In 1767, the corregidor Luis Manuel de Zañartu, launched one of the most important architectural works of the entire colonial period, Calicanto Bridge, effectively allowing the city to join La Chimba to north of the river, and began the construction of embankments to prevent overflows of the Mapocho River. Although the bridge was able to be built, the stems were constantly destroyed by the river. In 1780, Governor Agustín de Jáuregui hired the Italian architect Joaquín Toesca, who would design, among other important works, the façade of the cathedral, the Palacio de La Moneda, the canal San Carlos, and the final construction of the embankments during the government of Ambrosio O'Higgins. These important works were opened permanently in 1798. The O'Higgins government also oversaw the opening of the road to Valparaíso in 1791, which connected the capital with the country's main port. Two new earthquakes hit the city, one on 19 November 1822, and another on 20 February 1835. These two events, however, did not prevent the city's rapid, continued growth. In 1820, the city reported 46,000 inhabitants, while in 1854, the population reached 69,018. In 1865, the census reported 115,337 inhabitants. This significant increase was the result of suburban growth to the south and west of the capital, and in part to La Chimba, a vibrant district growing from the division of old properties that existed in the area. This new peripheral development led to the end of the traditional checkerboard structure that previously governed the city center. During the years of the Republican era, institutions such as the University of Chile (Universidad de Chile), the Normal School of Preceptors, the School of Arts and Crafts, and the Quinta Normal, which included the Museum of Fine Arts (now Museum of Science and Technology) and the National Museum of Natural History, were founded. Created primarily for educational use, they also became examples of public planning during that period. In 1851, the first telegraph system connecting the capital with the Port of Valparaíso was inaugurated. The city became the main hub of the national railway system. The first railroad reached the city on 14 September 1857, at the Santiago Estación Central railway station. Under construction at the time, the station would be opened permanently in 1884. During those years, railways connected the city to Valparaíso as well as regions in the north and south of Chile. The streets of Santiago were paved and by 1875 and there were 1,107 railway cars in the city, while 45,000 people used tram services on a daily basis. The 1920 census estimated the population of Santiago to be 507,296 inhabitants, equivalent to 13.6% of the population of Chile. This represented an increase of 52.47% from the census of 1907, i.e. an annual growth of 3.3%, almost three times the national figure. This growth was mainly due to the arrival of farmers from the south who came to work in factories and railroads which were under construction. However, this growth was experienced on the outskirts and not in the town itself. During this time, the downtown district was consolidated into a commercial, financial and administrative center, with the establishment of various portals and locales around Ahumada Street and a Civic District in the immediate surroundings of the Palace of La Moneda. The latter project involved the construction of various modernist buildings for the establishment of the offices of ministries and other public services, as well as commencing the construction of medium-rise buildings. On the other hand, the traditional inhabitants of the center began to migrate out of the city to more rural areas like Providencia and Ñuñoa, which hosted the oligarchy and the European immigrant professionals, and San Miguel for middle-class families. Furthermore, in the periphery villas were built various partners from various organizations of the time. Modernity expanded in the city, with the appearance of the first theaters, the extension of the telephone network and the opening of the Airport Los Cerrillos in 1928, among other advances. With the start of the transition to democracy in 1990, the city of Santiago had surpassed the three million inhabitants, with the majority living in the south: La Florida was the most populous area, followed by Puente Alto and Maipú. The real estate development in these municipalities and others like Quilicura and Peñalolen largely came from the construction of housing projects for middle-class families. Meanwhile, high-income families moved into the foothills, now called Barrio Alto, increasing the population of Las Condes and giving rise to new communes like Vitacura and Lo Barnechea. Moreover, although poverty began to drop significantly, there remained a strong dichotomy between the thriving global city and scattered city slums. Entering the twenty-first century, rapid development persisted in Santiago. The Civic District was renewed with the creation of the Plaza de la Ciudadanía and construction of the Ciudad Parque Bicentenario to commemorate the bicentenary of the Republic. 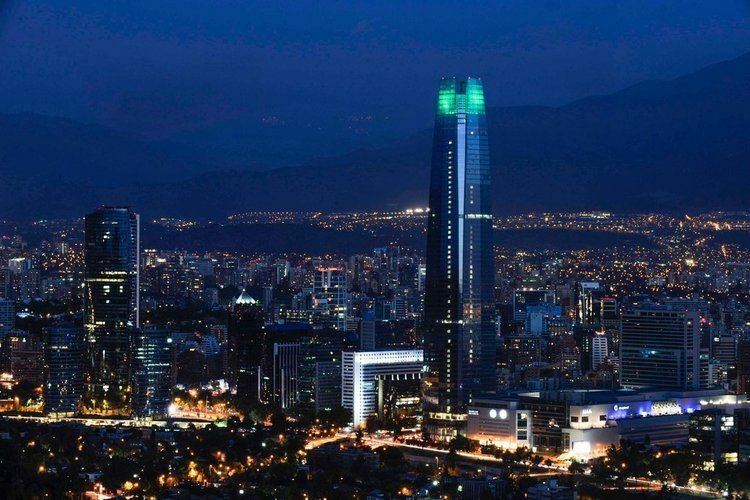 The development of tall buildings continues in the eastern sector, which culminated in the opening of the skyscrapers Titanium La Portada and Gran Torre Santiago in real the Costanera Center complex. However, socioeconomic inequality and geosocial fragmentation remain two of the most important problems in both the city and the country. On 27 February 2010, a strong earthquake was felt in the capital, causing some damage to old buildings. However, some modern buildings were also rendered uninhabitable. This generated much debate about the actual implementation of mandatory earthquake standards in the modern architecture of Santiago. The city lies in the center of the Santiago Basin, a large bowl-shaped valley consisting of broad and fertile lands surrounded by mountains. The city has a varying elevation, with 400 m (1,312 ft) in the western areas and 540 m (1,772 ft) at the Plaza Baquedano. It is flanked by the main chain of the Andes to the east and the Chilean Coastal Range to the west. On the north, it is bounded by the Cordón de Chacabuco, a mountain range of the Andes. The Andes mountains around Santiago are quite elevated; the tallest is the Tupungato mountain at 6,570 m (21,555 ft). Other mountains include Tupungatito, San José, and Maipo. Cerro El Plomo is the highest mountain visible from Santiago's urban area. The Mapocho River flows through the city. At the southern border lies the Angostura de Paine, an elongated spur of the Andes that almost reaches the coast. The Santiago Basin is part of the Intermediate Depression and is remarkably flat, interrupted only by a few hills; among them are Cerro Renca, Cerro Blanco, and Cerro Santa Lucía. This basin is approximately 80 kilometres (50 miles) in a north–south direction and 35 km (22 mi) from east to west. To the east stands the massive Sierra de Ramón, a mountain chain formed at the foothills of the Precordillera due to the activity of the San Ramón Fault, reaching 3296 metres at the Cerro de Ramón. 20 km (12 mi) further east is the Cordillera of the Andes with its mountain ranges and volcanoes, many of which exceed 6,000 m (19,690 ft) and in which some glaciers are present. During recent decades, urban growth has outgrown the boundaries of the city, expanding to the east closer to the Andean Precordillera. In areas such as La Dehesa, Lo Curro, and El Arrayan, urban development is present at over 1,000 metres of altitude. Santiago, in the airport area of Pudahuel, has a cool semi-arid climate (BSk according to the Köppen climate classification), with Mediterranean (Csb) patterns: warm dry summers (November to March) with temperatures reaching up to 35 °C (95 °F) on the hottest days; winters (June to August) are cool and humid, with cool to cold mornings; typical daily maximum temperatures of 14 °C (57 °F), and low temperatures near 0 °C (32 °F). In climate station of Quinta Normal (near downtown) the precipitation average is 312 mm, and in climate station of Tobalaba (in higher grounds near Andes Mountains) the precipitation average is 347 mm. In both the climate observed is "warm temperate with long dry season", that is a Mediterranean (Csb) climate. In the airport area of Pudahuel, mean rainfall is 282 mm (11.10 in) per year, about 80% of which occurs during the winter months (May to September), varying between 50 and 80 mm (1.97 and 3.15 in) of rainfall during these months. That amount contrasts with a very dry season during the summer months between December and March, when rainfall does not exceed 4 mm (0.16 in) on average, caused by an anticyclonic dominance continued for about seven or eight months. There is significant variation within the city, with rainfall at the lower-elevation Pudahuel site near the airport being about 20 percent lower than at the older Quinta Normal site near the city centre. Santiago’s rainfall is highly variable and heavily influenced by the El Niño Southern Oscillation cycle, with rainy years coinciding with El Niño events and dry years with La Niña events. The wettest year since records began in 1866 was 1900 with 819.7 millimetres (32.27 in) – part of a “pluvial” from 1898 to 1905 that saw an average of 559.3 millimetres (22.02 in) over eight years incorporating the second wettest year in 1899 with 773.3 millimetres (30.44 in) – and the driest 1924 with 66.1 millimetres (2.60 in). Typically there are lengthy dry spells even in the rainiest of winters, intercepted with similarly lengthy periods of heavy rainfall. For instance, in 1987, the fourth wettest year on record with 712.1 millimetres (28.04 in), there was only 1.7 millimetres (0.07 in) in the 36 days between 3 June and 8 July, followed by 537.2 millimetres (21.15 in) in the 38 days between 9 July and 15 August. Precipitation is usually only rain, as snowfall only occurs in the Andes and Precordillera, being rare in eastern districts, and extremely rare in most of the city. In winter, the snow line is about 2,100 metres (6,890 ft), and it ranges from 1500 metres (4900 feet) up to 2900 metres (9500 feet). Temperatures vary throughout the year from an average of 20 °C (68 °F) in January to 8 °C (46 °F) in June and July. In the summer days are very warm to hot, often reaching over 30 °C (86 °F) and a record high close to 37 °C (99 °F), while nights are very pleasant and cool, at 11 °C (52 °F). During autumn and winter the temperature drops, and is slightly lower than 10 °C (50 °F). The temperature may even drop to 0 °C (32 °F), especially during the morning. The historic low of −6.8 °C (20 °F) was in July 1976. Santiago’s location within a watershed is one of the most important factors determining the climate of the city. The coastal mountain range serves as a screen that stops the spread of maritime influence, contributing to the increase in annual and daily thermal oscillation (the difference between the maximum and minimum daily temperatures can reach 14 °C) and maintaining low relative humidity, close to an annual average of 70%. It also prevents the entry of air masses, with the exception of some coastal low clouds that penetrate to the basin through the river valleys. The 1960 Valdivia earthquake and the 1985 Algarrobo earthquake both caused damage in Santiago, and led to the development of strict building codes with a view to minimising future earthquake damage. In 2010, Chile was struck by the sixth largest earthquake ever recorded, reaching 8.8 on the moment magnitude scale. 525 people died, of whom 13 were in Santiago, and the damage was estimated at 15–30 billion US dollars. 370,000 homes were damaged, but the building codes implemented after the earlier earthquakes meant that despite the size of the earthquake, damage was far less than that caused a few weeks earlier by the 2010 Haiti earthquake, in which at least 100,000 people died. Santiago's air is the most polluted air in Chile. In the 1990s air pollution fell by about one-third, but there has been little progress since 2000. A study by a Chilean university found in 2010 that Santiago pollution had doubled. Particulate matter air pollution is a serious public health concern in Santiago, with atmospheric concentrations of PM2.5 and PM10 regularly exceeding standards established by the US Environmental Protection Agency and World Health Organisation. Diesel truck exhaust is another major source of winter smog. A lengthy replacement process of the transit system that began in 2005 was ended in 2010. The Mapocho River, which crosses the city from the northeast to the southwest of the Central Valley, remains contaminated by household, agricultural, and industrial sewage, and by upstream copper-mining waste (there are a number of copper mines in the Andes east of Santiago), which is dumped untreated into the river. Laws exist which require industries and local governments to treat all wastewater discharges, but these regulations are often loosely enforced. There are now a number of large wastewater processing and recycling plants under construction, and ongoing plans to decontaminate the river and make it navigable. Noise levels on the main streets are high, mostly because of noisy diesel buses. The growth of Santiago has undergone several changes over the course of its history. In its early years, the city had a rate of growth 2.68% annually until the 17th century, then down to less than 2% per year until the early 20th century figures. During the 20th century, Santiago experienced a demographic explosion as it absorbed migration from mining camps in northern Chile during the economic crisis of the 1930s. The population surged again via migration from rural sectors between 1940 and 1960. This migration was coupled with high fertility rates, and annual growth reached 4.92% between 1952 and 1960. Growth has declined, reaching 1.35% in the early 2000s. The size of the city expanded constantly; The 20,000 hectares Santiago covered in 1960 doubled by 1980, reaching 64,140 hectares in 2002. 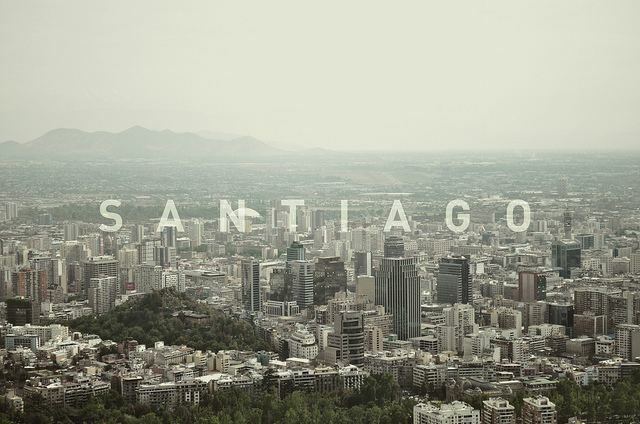 The population density in Santiago is 8,464 inhabitants/km2. The population of Santiago has seen a steady increase in recent years. In 1990 the total population under 20 years was 38.04% and 8.86% were over 60. Estimates in 2007 show that 32.89% of men and 30.73% of women were less than 20 years old, while 10.23% of men and 13.43% of women were over 60 years. For the year 2020, it is estimated that the figures will be 26.69% and 16.79%. 4,313,719 people in Chile say they were born in one of the communes of the Santiago Metropolitan Region, which according to the 2002 census, amounts to 28.54% of the national total. 67.6% of the current inhabitants of Santiago claim to been born in one of the communes of the metropolitan area. 2.11% of the inhabitants are immigrants, mainly from other Latin American countries such as Argentina and Peru. Santiago is Chile's retail capital. Falabella, Paris, Johnson, Ripley, La Polar, and several other department stores dot the mall landscape of Chile. The east side neighborhoods like Vitacura, La Dehesa, and Las Condes are home to Santiago's Alonso de Cordova street, and malls like Parque Arauco, Alto Las Condes, Mall Plaza (a chain of malls present in Chile and other Latin American countries) and Costanera Center are known for their luxurious shopping. Alonso de Cordova, Santiago's equivalent to Rodeo Drive or Rua Oscar Freire in São Paulo, has exclusive stores like Louis Vuitton, Hermès, Emporio Armani, Salvatore Ferragamo, Ermenegildo Zegna, Swarovski, MaxMara, Longchamp, and others. Alonso de Cordova also houses some of Santiago's most famous restaurants, art galleries, wine showrooms and furniture stores. The Costanera Center has stores like Armani Exchange, Banana Republic, Façonnable, Hugo Boss, Swarovski, and Zara. There are plans for a Saks Fifth Avenue in Santiago. Several mercados in the city sell local goods. Barrio Bellavista is where some of the most exclusive night clubs and chic cafes are located. Comodoro Arturo Merino Benítez International Airport (IATA: SCL) is Santiago's national and international airport and the principal hub of LATAM Airlines, Sky Airline, Aerocardal and JetSmart. The airport is located in the western commune of Pudahuel. The largest airport in Chile, it is ranked sixth in passenger traffic among Latin American airports, with 14,168,282 passengers served in 2012—a 17.04% increase over 2011. It is located 15 km from the city centre. Terminal San Borja: located in Metro station "Estación Central." Provides buses to all destinations in Chile and to some towns around Santiago. Terminal Alameda: located in Metro station "Universidad de Santiago." Provides buses to all destinations in Chile. Terrapuerto Los Héroes: located two blocks east of Metro station "Los Héroes." Provides buses to south of Chile and some northern cities, as well as Argentina (Mendoza and Buenos Aires) and Paraguay (Asunción). Terminal Pajaritos: located in Metro station "Pajaritos." Provides buses to the international airport, inter-regional services to Valparaíso, Viña del Mar and several other coastal cities and towns. Terminal La Cisterna: located in Metro station "La Cisterna." Provides buses to towns around southern Santiago, Viña del Mar, Temuco and Puerto Montt. Terminal La Paz: located about two blocks away from the fresh fruit and vegetables market "Vega Central;" the closest Metro station is "Puente Cal y Canto." It connects the rural areas north of Santiago. In the 1990s the government attempted to reorganize the public transport system. New routes were introduced in 1994 and the buses were painted yellow. The system, however, had serious issues with routes overlapping, high levels of air and noise pollution, and safety problems for both riders and drivers. To tackle these issues a new transport system, called Transantiago, was devised. The system was launched in earnest on 10 February 2007, combining core services across the city with the subway and with local feeder routes, under a unified system of payment through a contactless smartcard called "Tarjeta bip!". The change was not well received by users, who complained of lack of buses, too many bus-to-bus transfers, and diminished coverage. Some of these problems were resolved, but the system earned a bad reputation which it hasn't been able to shake off. As of 2011, the fare evasion rate is stubbornly high. The Metro de Santiago subway carries over two million passengers daily through its five lines (1, 2, 4, 4A, and 5), extending over 84 km (52 mi) and 108 stations. In 2010 a new extension to the commune of Maipú expanded the Metro to more than 105 km (65 mi) in length. Construction of two new lines (3 and 6) was confirmed recently by president Sebastián Piñera, and are expected to be operating in 2016. With 100 stations currently in operation and 19 other planned or under construction, the Santiago Metro is South America's most extensive metro system. The system has five operating lines and carries around 2,400,000 passengers per day. Two underground lines (Line 4 and 4A) and an extension of Line 2 were inaugurated in 2005 and 2006, and line 5 in 2011. The South Express Line, Line 6, will be finished by 2016, adding 12 stations to the network and approximately 15 km (9 mi) of track, and line 3 will be finished by 2018. EFE provides suburban rail service under the brandname of Metrotren. There is only one southbound route, serving 18 stations between Santiago's Central Station and San Fernando, via Rancagua. The electrified service expands over 138 km (86 mi). About 10 daily trains operate the full distance in each direction, with up to 30 trains between Santiago and Graneros. Transantiago is the name for the city's public transport system. It works by combining local (feeder) bus lines, main bus lines, and the Metro network. It includes an integrated fare system, which allows passengers to make bus-to-bus or bus-to-metro transfers for the price of one ticket, using a contactless smartcard. Uber operates in Santiago and is a safe and reliable option. The average amount of time people spend commuting with public transit in Santiago, for example to and from work, on a weekday is 84 min. 23% of public transit riders, ride for more than 2 hours every day. The average amount of time people wait at a stop or station for public transit is 15 min, while 21% of riders wait for over 20 minutes on average every day. The average distance people usually ride in a single trip with public transit is 7.4 km, while 15% travel for over 12 km in a single direction. As in most of Chile, the majority of the population of Santiago is Catholic. According to the National Census, carried out in 2002 by the National Statistics Bureau (INE), in the Santiago Metropolitan Region, 3,129,249 people 15 and older identified themselves as Catholics, equivalent to 68.7% of the total population, while 595,173 (13.1%) described themselves as Evangelical Protestants. Around 1.2% of the population declared themselves as being Jehovah's Witnesses, while 2.00% identified themselves as Latter-day Saints (Mormons), 0.25% as Jewish, 0.11% as Orthodox and 0.03% as Muslim. Approximately 10.4% of the population of the Metropolitan Region stated that they were atheist or agnostic, while 5.4% declared that they followed other religions. In 2010 construction was initiated on the continental Bahá'í House of Worship for South America in the commune of Peñalolen. Construction at the site nears completion and a dedication is planned for October, 2016.